Afternoon everyone! It was another lovely day that I spent outside soaking up all the great weather. :P It's supposed to rain the next 3 days, so I'm sure I will have some earlier posts then and get a lot of swatching done while I'm stuck inside. 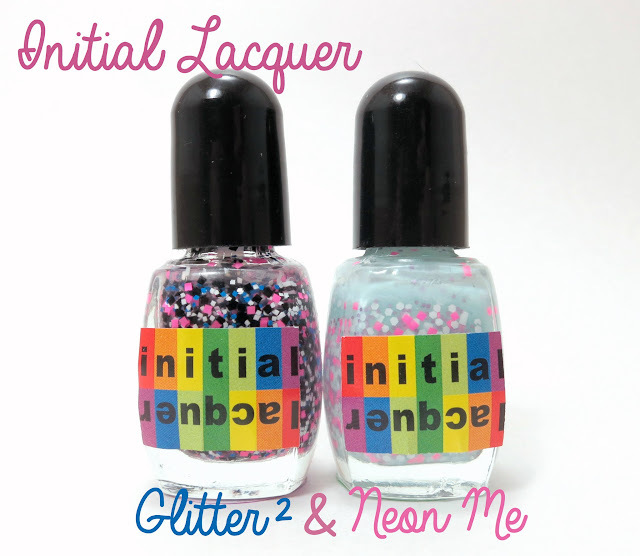 ;) I have the last 2 new polishes from Initial Lacquer to share with you all today! Glitter² contains matte blue, pink, black and white square glitters in a clear base. All nails are 1 coat of Glitter² over 3 coats of Initial Lacquer Love Voyage and a top coat of Seche Vite. I love this name of this polish! It obviously fits the polish perfectly and is really clever. :) I also love the combination of glitters in this polish! Over Love Voyage, it reminds me of spring and summer coming together. :) Glitter² is jam packed with glitter, but this doesn't hinder dry time at all. I think there is so much glitter in this you could probably make it opaque in 3 coats! Neon Me has a light Mint crelly base with white, purple and neon pink glitters. I used 3 coats with a top coat of Seche Vite. Like Mr.BluBlu there is something about this base color, that's just stunning on it's own right. The glitters don't get lost amongst it and the pink and purple glitters add a nice pop of color. Formula was great; no fishing for glitter and it dried quickly. To purchase any of Initial Lacquer's awesome polishes visit her Etsy store. Follow Initial Lacquer on Facebook and Tumblr for shop updates and information about new polishes coming out.